Join us for plenty of amazing arts and entertainment! 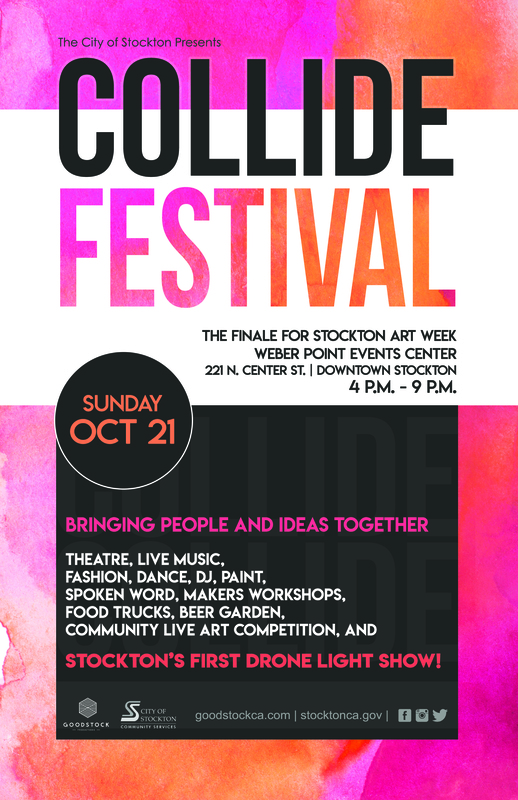 Collide Festival is a finale to Stockton Arts week brought to you by City of Stockton | Recreation Division in collaboration with Goodstock Productions. Collide is a family friendly FREE event. From the City of Stockton, Recreation Dept: 10/21/2018 @ 2:30pm: Due to circimstances beyond our control, the Lighted Drone Show has been CANCELLED! Join us for a Stockton Arts Week experience like no other! ...and many more incredible performances. Spoken Word by With Our Words / WOWinc.